Apple iOS is among the best mobile operating systems on the market. Apple’s iOS operating system gets an overall polishing every year when Apple releases new software updates. Back in 2010, Apple released iOS 10 to the public after months of rumors and speculation. For some background, iOS 10 is the biggest iOS release Apple has ever made so far. iOS 10 marked the introduction of a lot of new things we all love about iOS. With iOS 10, Apple finally opened its operating system to third-party developers, giving us more options and ways to interact with apps. At this year’s WWDC event, iOS 12 took the center stage alongside macOS Mojave and watchOS 5. In reality, iOS 12 is the latest version of Apple’s mobile operating system, promising big upgrades through redesigned apps and improved user interface. Basically, iOS 12 does not bring in a significant upgrade, but it comes with a slew of new things we have been craving for in recent years like Timeline, Group FaceTime, Siri shortcuts, new Animoji, or revamped Maps app. 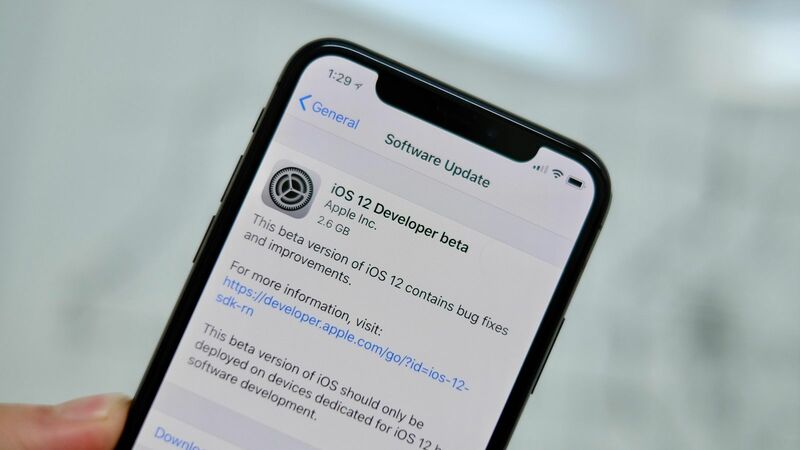 However, iOS 12 is still in beta stages, so it may come with errors and bugs. Fortunately, Apple has acknowledged the issues and promises to fix them in upcoming releases. Specifically, a lot of iPhone owners have reported that their iPhone’s battery drains so fast after updating to iOS 12. If you are among those users who have been hit by the issue, then we believe that we can help you out. In the section below, we are going to show you how to fix battery draining quickly in iOS 12. Keep in mind that Apple is rolling out the beta versions of iOS 12 for testing purposes. Apple’s move aims to collect user feedback ahead of the final release. The final build of iOS 12 is expected to hit compatible devices this fall. For some background, Apple removed Group FaceTime from the iOS 12 beta and has instead decided to release it in the future update. It remains unknown if Apple will add the feature to the final build of iOS 12. Let’s wait and see. There could be any reason for why the battery runs out so fast in iOS 12, ranging from outdated software update and background apps to location services and infected apps. The first thing you need to do is to get the latest iOS 12 software update. To do this, open the Settings app from your home screen, then tap General and select Software Update. Once you are in, check for any available updates and install them on your device. Now just simply check if the problem is fixed. If nothing changes, make sure you read on to find out more. If the problem is still present, then the next solution is to identify which iPhone apps are eating up your power. Fortunately, Apple now allows you to get all the information about your battery including the last charge level, battery’s health, and many more. To do this, launch the Settings app on your iPhone, and then tap Battery. Once you are in, you will be presented with a number of battery options. Specifically, you can quickly check battery usage on your iPhone or your battery’s health. Now just simply select tap Show Activity, then hit Battery Usage and hit Last 10 Days. After that, find out which apps are draining your power and kill them. Apple iOS now includes a battery feature that allows you to check if your battery needs to be replaced or not. The feature came after reports claiming that Apple was slowing down old iPhone models due to aging batteries. To fix this, Apple offered a battery replacement program for infected iPhone models. Sources say that Apple needs more time to work on battery issues ahead of the final release of iOS 12. Location services feature has been part of Apple iOS for years. As the name suggests, Location Services allows Apple and third-party apps to collect your iPhone’s location to offer nearby services. However, location services is one of the biggest power-sucking demons. Therefore, it’s a good idea to disable it. To turn off Location Services, you simply need to launch Settings, then hit Privacy, and select Location Services. After that, turn off the switch for Location Services at the top. If you do not want to disable Location Services completely, then you can choose to turn on Location for certain apps. To do this, select the app from the list and then select While Using the App. Following this method, Location Services automatically turns on when the app or one of its features are visible on the screen. Background App Refresh has been out there for years, allowing iPhone and iPad apps to perform multi-tasks all the time. While this comes in handy, one major drawback is that it drains your battery very quickly. Therefore, it’s a good idea to turn it off to save some battery life. You can disable Background App Refresh for certain apps on your iPhone or iPad. To do this, you simply need to toggle it off to the right of the app you wish to disable Background App Refresh for. iOS includes Low Power mode, a handy feature that automatically turns off background app refresh, automatic downloads, and reduces mail fetch to lower power consumption. To turn it on, open the Settings app on your device, then select Battery and turn on the switch for Low Power mode. Besides, you can turn off Raise to Wake feature to save battery life. For some background, Raise to Wake allows you to turn on the screen of your iPhone every time you pick it up. To turn it off, head over to Settings > Display & Brightness > Raise to Wake and turn off the switch. These are the five solutions that help you fix battery draining fast in iOS 12. Hopefully, they work for you. If you have got any issues during the process, let us know in the comments below.